^ Feynman, R.; Leighton, R.; Sands, M. The Feynman Lectures on Physics. Vol. 1. Addison-Wesley. 1989. ISBN 978-0-201-51003-4 （英语）. ^ Taylor, E. F.; Wheeler, J. A. Spacetime Physics: Introduction to Special Relativity（2nd ed.）. W.H. Freeman. 1992. ISBN 978-0-7167-2327-1 （英语）. ^ 3.0 3.1 3.2 3.3 3.4 3.5 3.6 3.7 3.8 3.9 Binney, J.; Merrifeld, M. Galactic Astronomy. Princeton University Press. 1998. ISBN 978-0-691-02565-0 （英语）. ^ 4.0 4.1 4.2 4.3 4.4 4.5 4.6 4.7 4.8 4.9 Carroll, B. W.; Dale, A. O. An Introduction to Modern Astrophysics. Addison-Wesley Publishing Company, Inc. 1996. ISBN 978-0-201-54730-6 （英语）. ^ 5.0 5.1 5.2 5.3 5.4 5.5 5.6 5.7 5.8 5.9 Kutner, M. Astronomy: A Physical Perspective. Cambridge University Press. 2003. ISBN 978-0-521-52927-3 （英语）. ^ 6.0 6.1 6.2 Misner, C.; Thorne, K. S.; Wheeler, J. A. Gravitation. San Francisco: W. H. Freeman. 1973. ISBN 978-0-7167-0344-0 （英语）. ^ 7.0 7.1 7.2 Weinberg, S. Gravitation and Cosmology. John Wiley. 1971. ISBN 978-0-471-92567-5 （英语）. ^ Doppler, C. Beiträge zur fixsternenkunde. Prague: Druck von G. Haase sohne. 1846 （德语）. ^ Maulik, D. Doppler sonography: A brief history. Doppler ultrasound in obstetrics and gynecology. Springer Berlin Heidelberg. 2005: 1–7 （英语）. ^ O'Connor, J. J.; Robertson, E. F. Christian Andreas Doppler. MacTutor. 1998 [2016-07-10] （英语）. ^ 11.0 11.1 Huggins, W. Further Observations on the Spectra of Some of the Stars and Nebulae, with an Attempt to Determine Therefrom Whether These Bodies are Moving towards or from the Earth, Also Observations on the Spectra of the Sun and of Comet II., 1868. Philosophical Transactions of the Royal Society of London. 1868, 158: 529–564 （英语）. ^ Reber, G. Intergalactic Plasma. Astrophysics and Space Science. 1995, 227: 93–96 （英语）. ^ Bélopolsky, A. On an Apparatus for the Laboratory Demonstration of the Doppler-Fizeau Principle. Astrophysical Journal. 1901, 13: 15 （英语）. ^ Slipher, V. M. The radial velocity of the Andromeda Nebula. Lowell Observatory Bulletin. 1913, 2: 56–57 （英语）. ^ Slipher, V. M. Spectrographic observations of nebulae. Popular Astronomy. 1915, 23: 21–24 （英语）. ^ Hubble, E. A relation between distance and radial velocity among extra-galactic nebulae. Proceedings of the National Academy of Sciences. 1929, 15 (3): 168–173 （英语）. ^ Swift Redshift Measurements. NASA. 2012 [2016-07-10] （英语）. ^ Ives, H. E.; Stilwell, G. R. An experimental study of the rate of a moving atomic clock. JOSA. 1938, 28 (7): 215–219 （英语）. ^ Freund, J. Special Relativity for Beginners. World Scientific. 2008: 120. ISBN 981-277-160-3 （英语）. ^ Ditchburn, R. Light. Dover. 1961: 329. ISBN 0-12-218101-8. ^ Eddington, A. The Expanding Universe: Astronomy's 'Great Debate', 1900-1931. Cambridge University Press. 1933. ISBN 0521349761 （英语）. ^ Harrison, E. R. Cosmology: The Science of the Universe. New York: Cambridge University Press. 1981. ISBN 978-0521661485 （英语）. ^ Davis, T. M.; Lineweaver, C. H.; Webb, J. K. Solutions to the tethered galaxy problem in an expanding universe and the observation of receding blueshifted objects. American Journal of Physics. 2003, 71: 358–364 （英语）. ^ 24.0 24.1 24.2 Peebles, P. J. E. Principles of Physical Cosmology. Princeton University Press. 1993. ISBN 978-0-691-01933-8 （英语）. ^ Harrison, E. The redshift-distance and velocity-distance laws. The Astrophysical Journal. 1993, 403 (1): 28–31 （英语）. ^ Odenwald, S.; Fienberg, R. T. Galaxy redshifts reconsidered (PDF). Sky and Telescope. 1993, 85 (2): 31–35. （原始内容 (PDF)存档于2016-08-17） （英语）. ^ Weiss, M. What Causes the Hubble Redshift. The Original Usenet Physics FAQ. 1994 [2016-07-07] （英语）. ^ Chant, C. A. Notes and Queries (Telescopes and Observatory Equipment-The Einstein Shift of Solar Lines). Journal of the Royal Astronomical Society of Canada. 1930, 24: 390 （英语）. ^ Einstein, A. On the relativity principle and the conclusions drawn from it. Jahrbuch der Radioaktivität und Elektronik. 1907, 4: 411–462 （德语）. ^ Pound, R. V.; Rebka Jr., G. A. Apparent weight of photons. Physical Review Letters. 1960, 4 (7): 337 （英语）. ^ Sachs, R. K.; Wolfe, A. M. Perturbations of a cosmological model and angular variations of the cosmic microwave background. Astrophysical Journal. 1967, 147 (1): 73–90 （英语）. ^ Reboul, H. J. Untrivial redshifts-A bibliographical catalogue. Astronomy and Astrophysics Supplement Series. 1981, 45: 129–144 （英语）. ^ Burbidge, G. Noncosmological redshifts. Publications of the Astronomical Society of the Pacific. 2001, 113 (786): 899–902 （英语）. ^ Budding, E. Introduction to Astronomical Photometry. Cambridge University Press. 1993. ISBN 978-0-521-41867-6 （英语）. ^ Baum, W. A. Problems of extra-galactic research. (编) G. C. McVittie. IAU Symposium No. 15. Kluwer: 390. 1962 （英语）. ^ Libbrecht, K. G. Solar and stellar seismology. Space Science Reviews. 1988, 37 (3-4): 275–301 （英语）. ^ Oort, J. H. The formation of galaxies and the origin of the high-velocity hydrogen. Astronomy and Astrophysics. 1970, 7: 381–404 （英语）. ^ Asaoka, Ikuko. X-ray spectra at infinity from a relativistic accretion disk around a Kerr black hole (PDF). Astronomical Society of Japan, Publications. 1989, 41 (4): 763–778. ISSN 0004-6264 （英语）. 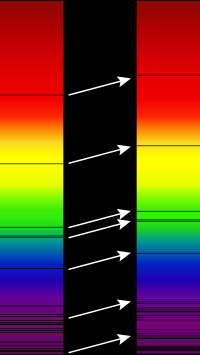 ^ Rybicki, G. B.; Lightman, A. R. Radiative Processes in Astrophysics. John Wiley & Sons. 1979: 288. ISBN 978-0-471-82759-7 （英语）. ^ Pelló, R.; Schaerer, D.; Richard, J.; Le Borgne, J.-F.; Kneib, J. P. ISAAC/VLT observations of a lensed galaxy at z = 10.0. Astronomy and Astrophysics. 2004, 416: L35 （英语）. ^ Peebles, P. J. E.; Ratra, Bharat. The cosmological constant and dark energy. Reviews of Modern Physics. 2003, 75: 559–606 （英语）. ^ Geller, M. J.; Huchra, J. P. Mapping the Universe. Science. 1989, 246 (4932): 897–903 （英语）. ^ THE CfA REDSHIFT SURVEY. [2016-07-10] （英语）. ^ 2dF Galaxy Redshift Survey homepage. [2016-07-07] （英语）. ^ The Sloan Digital Sky Survey: Mapping the Universe. [2016-07-10] （英语）. Lineweaver, C. H.; Davis, T. M. Misconceptions about the big bang (PDF). Scientific American. 2005, 292 (3): 36–45 （英语）.